There has been much buzz about the internet lately regarding Apple's new iTunes4, which features Apple's iTunes Music Store built in. Mr. Tangent wrote in with a bunch of related bits about Nine Inch Nails and the new service. 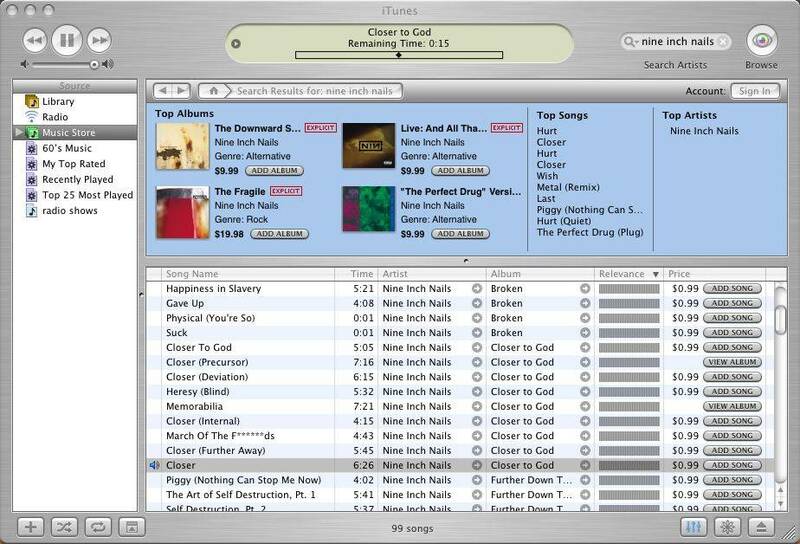 I was using the new iTunes 4, which has Apple's Music service built in and searched for NIN. It appears NIN's entire discography is available for high resolution AAC/mpeg4 (think mp3, but higher resolution and lower file size) download. The nice thing, before you decide to purchase a song ($.99c and you're able to burn it, copy it to your iPod) or album ($9.99) you can listen to high quality 30 second previews of each song directly within iTunes. When you buy the music you also get the album artwork. I haven't tried purchasing any music yet, but the service seems really nifty. It's nice to have an alternative to all the P2P apps, since downloading music without paying for it is theft and hurts the musicians. Check out this screenshot he sent along, with search results for Nine Inch Nails. Not too shabby. Along these lines, Mr. T also noted that Fortune Magazine is running this article on the story behind iTunes and Apple's legal digital music downloads, which quotes Trent a couple of times on the topic. This weekend, MTV aired The 25 Greatest Video Stars (or something to that effect) Apparently this was something we could have voted on, but no one told us, so we didn't tell you. Even without our usually rallying cry, to the polls, Trent came in #19. The rest of the list? Oh, that's merely consequential. During the show, they have a recent interview with Trent, pictured here thanks to violent_n_delicious' posts on Echoing the Sound. There are several larger shots, and, well, an ongoing discussion about his hair, in this particular thread on the board. Trent: "I don't really know what a video star means and I certainly don't feel like a video star." Dave Grohl: "The videos mirror the twisted side of the music." A crappy video director who's name I don't remember: "nine inch nails was a group that dared to go very dark." Trent: "It's tough being scary all the time." Good Charlotte: "The video for Closer is just so one of a kind. There will never be another video like Closer." Dave Grohl talking about Closer: "You couldn't help but want to watch it...even if it made you feel kinda dirty." Trent talking about Closer: "I thought it worked really well because it wasn't literal and it made the song sound better to me. It framed the song. The problem with making a really good video is that now you have to make another really good video. I think as an artist its important to take chances and try new things. Its nice to feel that we may have made some marks or made some strides presenting ourselves in this medium effectively." MTV will re-air the segment tomorrow at 3pm EST. According to vincedb on Echoing the Sound, the new Peter Gabriel single, Growing Up, is available in Italy, France, and Germany. The UK and US release dates are still a ways off however. The (click to enlarge) scan of the cover found on the left is from an eBay auction of the single, which features a new remix by Trent Reznor. Just so you know. There was a domain name ownership dispute similar to what happened here at the Hotline (which is why both .com and .net point to the same page now). Those looking for the message board, simply point your browsers, change your bookmarks and links, etc. to .net. Yow! You may recall that just recently we started hosting The NIN Historian's site. Well, on Tuesday, the site underwent major reconstruction, and I recommend you all check it out and have a look around - even if you've already been there. Excellent work by NIN_Historian! Keep in mind, this site is rather bandwidth intensive, with lots of scans of tour related memorabilia, and is not particularly modem-friendly. Cable, DSL or faster connection speeds are recommended. As a side note; we have another very large addition to the Hotline coming up - one of my personal favorite fan sites that had recently closed down: the webmaster was cool enough to send the whole thing on CDR to me and I'll be posting it shortly after I get the new Keith Hillebrandt interview/Useful Noise v2 Review online. MTV2 is now polling viewers for thier 22 best bands of the last 22 years. This slightly random poll actually has alot of good, yet popular, bands on it, including Depeche Mode, The Smiths, Radioheaed, N'sync, The Cure and more. huh? Anyway, cast your vote here. Digitair wrote in to make mention that all the press surrounding Apple looking to buy Universal has perked up the ears of another interested buyer. While this isn't necessarily directly related to Nine Inch Nails, it is probably still worth noting, considering the companies involved. According to this Washington Post article, Apple is considering buying Universal Music Group from the current owner, French Utility company Vivendi. lakanen wrote in to mention that Siren Disc has listed that the single for Growing Up by Peter Gabriel has been pushed back to June 30th. One might speculate that this is simply the result of Trent's name being attached to the project, but really that has nothing to do with it: The remix has been done since February. DyRE sends word that Amazon.com is listing an April 14th release date for the Growing Up single by Peter Gabriel, which features a six and a half minute long remix by Trent Reznor. Whereas the European release we posted about earlier is due out April 22nd and only costs �6.99, the US release comes a full week ahead of that - and is listed at $11.99USD. 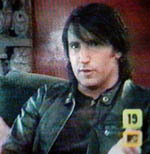 Trent Reznor appeared in a taped tribute to Johnny Cash for his recent Hurt music video. Johnny Cash was awarded the "Special Achievment Award" for the Hurt video at Country Music Television's "Flameworthy Music Videos Award Show". Trent Reznor and Mark Romanek were featured in the 2 minute tribute clip, along with other music stars. There's an encore tonight at 11pm EST and also on Tuesday, at 5:30pm EST. News submitted by: Kevin and Colt. A big thanks to Kevin for hosting a clip here at his website! The April issue of SickAmongThePure.net is now online. We also have the 2002 back issues online finally. Check it out. A new interview on GamingCubed.com with Chris Vrenna sheds light on Vrenna's work on the Matrix 2 soundtrack. Chris discusses his personal videogame preferences and hints that he will be working on another game. "I am in the middle of a game score right now for a game coming out late this year. I am not allowed to discuss it just yet tho. I think they will be announcing it at E3." The E3 Conference this year is in Los Angeles from May 13th-16th. As you've probably heard, Nine Inch Nails live bassist, Danny Lohner, has recently joined A Perfect Circle. The new band, which also now features Twiggy Ramierez, will be filling in for Queens of the Stone Age on a few Lollapalooza tour-stops on the west coast of the US. Check out the Lollapalooza website for more information. According to Amazon.de Trent Reznor will be remixing Peter Gabriel's "Growing Up" Maxi-Single. The album is priced at 6.99 Euros. This release hasn't been confirmed yet. Fools, it's the first of April! 1) Evan Moore did not join the Hotline. He's really busy right now, probably with more important things, otherwise he'd be updating SLSNews right now. 3) Trent is not playing with Prick in Cleveland this weekend. Prick is playing in Cleveland, and a bunch of digital noise folks are going to see the show though. If you bought tickets thanks to this gag, you can go beat up Azroth in person, he suggested that one. 4) Disrepare was a forced typo for Disrepair, which really doesn't have anything to do with Nine Inch Nails save for being a lyric in Deep, so far as we know. I didn't intend for people to think that the next NIN album was going to be in French. 5) Charlie Clouser may live in LA, but he had nothing to do with the new Radiohead album, ironically titled Hail To The Theif, of which an early version was leaked to the Internet this past weekend, two months ahead of the actual release. 6) The CSI News is legit, although I'm not sure why Josh said that two nights ago was April 2nd. That goes far beyond time zone leaps. Meathead sums it up pretty well at the bottom of his current meathead perspective: "Note: We need real NIN news. Bad." the cover of by johnny cash came out on the opening sequence of the nbc drama tonight, during which officer sullivan weighed the recent events in his life leading to his alcoholism and attempted suicide. it was the perfect song for this great episode, which signaled both an end to sulli's depression and addiction, and the beginning of his healing. "Tonight 04/02/2003 on CSI: Miami, the song Slipping Away, off of the �Things Falling Apart� album was played during the �discovering evidence� scene. About a min of the song was played, with the lyrics left in, �I Keep slipping away�"
After neerly a year of not updating SLS News, and having to dump the SLS News BBS Board because of financial woahs, I have joined forces with the NIN Hotline to help prepare for the influx of news about the new NIN album Disrepare, which good friend Kraw tells me already has artwork and merchandice options laid out and with the final mixdown is in the works. I also brought the old SLS graphics designer, Jared, to help with the new look, combining the best of both worlds of the hotline and SLSNews. Look for more changes this week, coming soon!!! Finaly, the latest album by Radiohead was leeked this weekend. Since this has happened, we can tell you now that the tracks Backdrafts and Mixmoatis actually were mixed by Charlie Closer while the band was recording in LA.